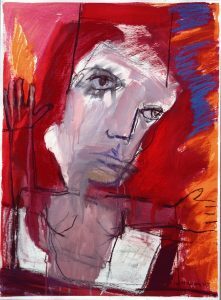 Lys Hansen has had an association with the University of Stirling and its Art Collection since 1968 but she came to prominence as a dynamic and challenging expressionist figurative painter in the early 1980s before the emergence of the New Glasgow Boys: Howson, Campbell, Currie and Wisniewski. In 1985 a major scholarship from the Scottish Arts Council afforded her the time and opportunity to work in Berlin, which had a profound effect and she has recently also worked in Denmark, Ireland and France. The University Art Collection held a major exhibition of Lys’s work in 2009 entitled ‘Relatively Closer’. Lys Hansen’s main concerns are the human condition and the complex inter-relationships of people, and this work is typical of this. Her wish is to lead the viewer through catharsis or empathy to resolve the emotions encountered.